As Star Wars fans we've been asked to suffer a number of indignities, narratively speaking, in terms of advancing the franchise we love. Since 1983, nearly every story to grace the screens in our life from video games to TV to the big screen were prequels or sidequels. Sure, we got a few glimpses to post-Return of the Jedi life, but when it came to sitting down in a dark theater or watching a TV show on Saturday morning or even with the family on a Friday night, we were repeatedly asked to watch a story to which we basically knew the ending. And we were good sports - The Phantom Menace kicked off a prequel trilogy and a cartoon that brought in $2.581 billion worldwide at the box office. For something fans claim to hate, that's nothing to sneeze at. We've been asked to watch another prequel show, but Star Wars Rebels kicks off 5 years before the original Star Wars and unlike previous entries into the prequel canon we don't know any of these people. One character shares a surname with an existing Twi'lek hero, which is a nice tie-in to the lore that's mostly being swept clean. While we have seen action figures that confirm R2-D2 and C-3PO are coming, these characters are unknowns trading on familiar archetypes. If you watched any of the first episodes of the Star Trek spin-offs, you know the drill - here's a bunch of people, you have a vague idea what they stand for and know a little bit about two or three of them. As time goes on you should get a quick grasp as to who's doing what and why, and with any luck you'll have a favorite character for reasons beyond simply looking cool and speaking platitudes about brotherhood, freedom, and so on. Boy howdy, the Clones could've used some variety. So what happens in Spark of Rebellion? We meet everybody, and everybody is a chatterbox. Star Wars' sound design is second to none - characters are known for their pauses and silences just as much as what they say. Darth Vader, Boba Fett, Darth Maul, even Han Solo convey a lot with a little. Han Solo can hold a finger up at C-3PO and he knows it's time to shut up. Darth Vader can express endless rage simply by looking out a window. Ezra Bridger (Taylor Gray) and his new friends, on the other hand, are here to tell you everything you need to know in about 44 minutes. The gimmick is this: Ezra is the same age as Luke, they share a birthday and he's also a Force-sensitive kid - although nothing is said about any great destiny. Kanan Jarrus (Freddie Prinze, Jr.) recognizes his abilities and takes him in, after the kid tries to steal a shipment of blasters which the Rebel group intends on selling to the black market. When presented in black and white terms, they're arguably the bad guys here, but the first thing we see is a couple of British-accented Imperials stealing fruit from a goofy voiced Gotal. This is a place where more glares and silences would have helped convey more menace, it's a sort of low-level bullying in a supposedly oppressive, xenophobic, and potentially racist galactic new order. The crew - made up of a stew of all things Star Wars over the years - includes Sabine Wren (Tiya Sircar), a Mandalorian tagger. Zeb Orrelios (Steve Blum), a big talker and a bruiser based on early McQuarrie Chewbacca concepts. 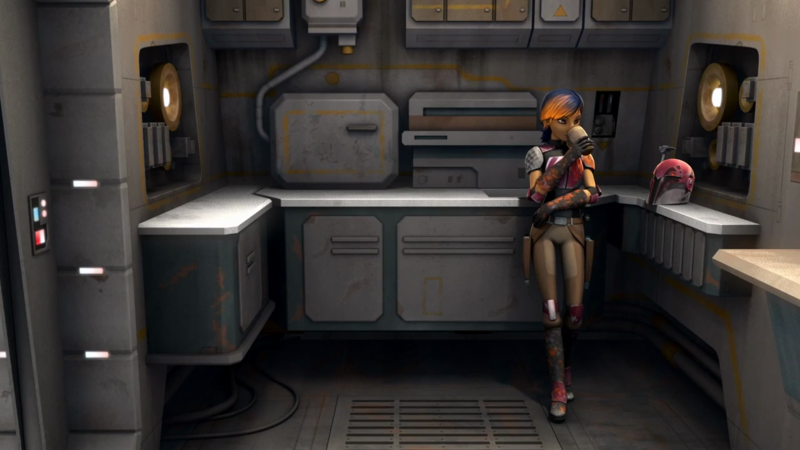 Hera Syndulla (Vanessa Marshall) feels most at home here, in an orange flight suit that looks like a couple of characters we've seen before, and she doesn't get to do much other than be competent and leave you wanting to know more about her. Chopper, an irritable astromech droid made of various barely-fixed and mismatched parts. Nobody of any consequence dies - just Stormtroopers - but we do get to meet Agent Kallus (a wonderful David Oyelowo) as well as briefly see the Inquisitor at the very end. Nobody comes off as particularly annoying, and the inclusion of non-Jedi women in the cast means we might see Star Wars Rebels pass the Bechdel Test rather quickly. Everybody's a little snarky, everybody talks a lot, but because it's all exposition there are no real stakes other than the Empire now knows there are Jedi out there and this nameless Inquisitor fellow has taken an interest in them. We've got a good cast, a great art department, and a passable story - the real test is going to be the first regular episode. But how did this one go? 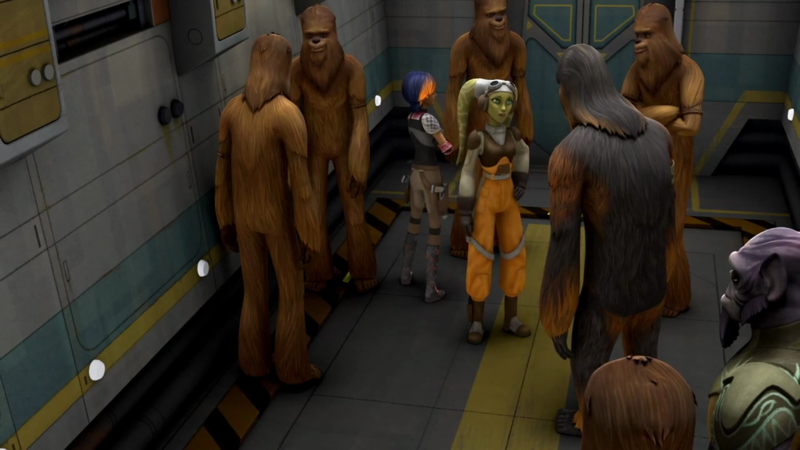 We get to see the Rebels take on Wookiee slave traders and there's a solid gag about Zeb being a rare, hairless Wookiee. 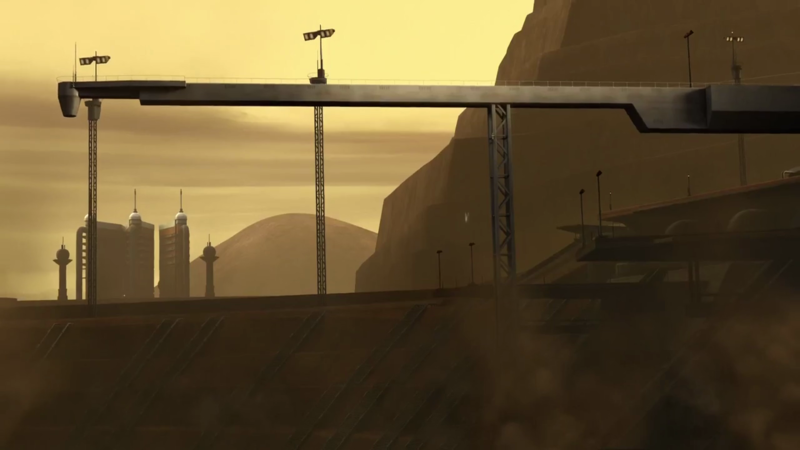 It's one of many great nods to the franchise, especially in the first few minutes - various alleys in Lothal carry more than a passing resemblance to old McQuarrie concept art, as do numerous citizens walking around doing their thing. While we're treated to Kenner-style TIE Fighters and skies that came right out of existing artwork, or existing set pieces like when we see Ezra get captured by the Imperials. It's all very familiar, and plays out like more or less exactly what you would expect. Obviously there's a rescue mission, because there's a botched slave rescue where Ezra gets captured and some explosives go off and blah blah blah. It's fairly paint-by-numbers pilot stuff - strangers meet, come together, defeat a common foe while a bigger, more dangerous foe lurks in the distance while conflict and mistrust reign supreme. Here we get the trappings of the prequels and Expanded Universe with a Holocron and an appearance from Obi-Wan Kenobi with a warning message - and one of hope - that ties in to the events of the original Star Wars film. I almost forgot to mention the music - while The Clone Wars felt like a strong departure from John Williams' tunes, it helped set a different tone for a different show for a different audience. While this show also aims for a different crowd, Kevin Kiner makes the music sound like it was largely derived from only the original film's score. It's so familiar it's distracting, and the same can be said of the sound effects - I've heard the same Chewbacca sound effects for years. I recognize the young Lumpy growls from the Holiday Special. And the Speeder Bike sound effects are just tired. Sure, they're cool, but I have to imagine every single vehicle in the Republic and Imperial motorpool can't sound exactly the same - sound designers used different engines as inspiration for the various Batmobiles over the years, don't we as Star Wars fans at least deserve pitched up or down engines to get something vaguely new? Chopper sounds quite different, though, but still familiar - there's an air of Gonk about the little guy. I'd say we're right where we started with The Clone Wars after that movie premiere, with the key difference that there's no one character that stood out as needing a rewrite. You've got a lot of nice good guys who are all a little young and brash, Hera seems the most reserved, and Chopper is far and away the winner of the best one to get as a toy. While The Clone Wars gave us a pretty good idea where the show was going and what the roles our leads all served, as well as the threat imposed by the galaxy, this one required that you as a fan bring something with you to the story. 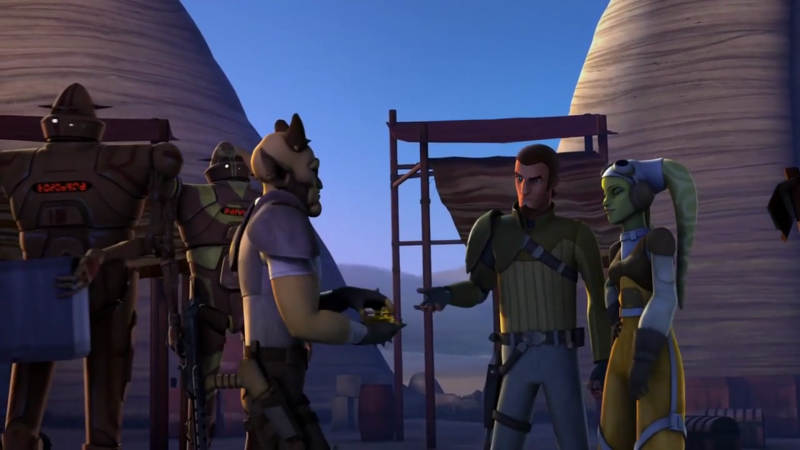 The Rebels don't necessarily come off as good guys so much as opportunists - sure, we see Ezra help a merchant but he also takes from the merchant. We see a bunch of random thugs blow stuff up, steal, and sell a bunch of guns - generally speaking, heroes aren't arms dealers. In Star Trek, one of the series' more morally ambiguous characters tends to draw the line at weapons most of the time. It's treated like a big deal and here, it isn't. We see the Empire kill one of their own in a comic moment that, while fun, doesn't quite fit in with the characters. Of course, that's the big difference in modern franchise storytelling - the first few James Bond movies had him sneaking around, but one or two movies in he was essentially a serial killer. 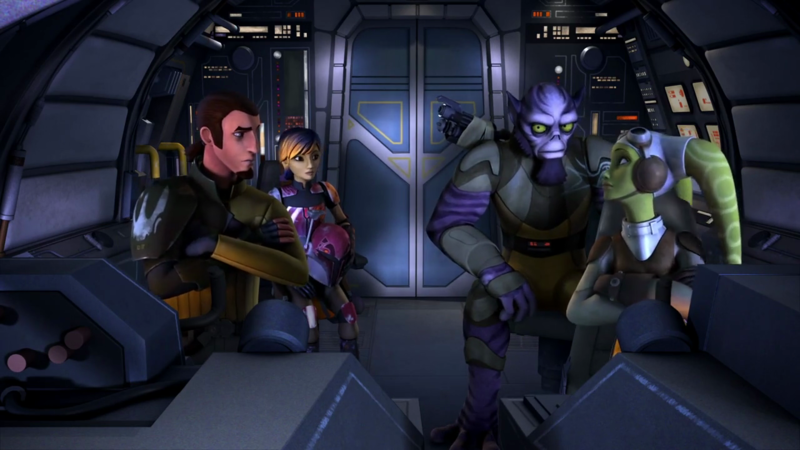 The Rebels are in the same place, but that's more or less consistent with Star Wars as a franchise. Granted, if I didn't see some shootin' I'd feel the word "Wars" should be removed from the title, so. Characterization means a lot - and if Hasbro's Transformers comics can make me care about second-stringer toys from 30 years ago in one or two issues, I hope Disney can do the same with Rebels. This was a pilot that felt like a pilot - it's a proof-of-concept with little emotional weight. It's a good tech demo with gorgeous art direction, so I hope we get to know some of these characters in a meaningful way that never happened in The Clone Wars. I learned more about Meebur Gascon's life story in 4 episodes than I did about Obi-Wan Kenobi's over 37 years, 6 movies, and 6 seasons of TV - who is he, really? Where does he come from? Is he really just an orphan or student raised by monks to be a good person with no personal desires? Gosh, I hope there's more there than that - and I hope the gang from Rebels give me a reason to root for them over the Empire beyond them simply being a space van full of meddling kids. Even Droids' crew of human sidekicks gave us that - we had an explorer, race enthusiasts, even traveling royalty - and their admittedly thin core desires and identities came to life almost immediately. Granted, the freedom fighter was one of the more poorly defined characters, so maybe the premise of do-gooders in this franchise is just ultimately flawed. Desire makes for a better story. Since word on the street has it we'll be progressing through linear time and not jumping around time and again, I hope we're spared the multi-part stories of The Clone Wars where we see an episode, and have a prequel to it a year or two later. Star Trek spent 1987 to 2001 driving us to the future of the 24th century, before dumping us back into prequel land. Star Wars has been giving us prequels to prequels to (in some cases) prequels since 1996 and hopefully if the rumors are true, this series really will put us on the road to laying the groundwork to the future that is Episode VII. Most of the characters seem like they were designed prior to 1980 with the exception of the fairly modern Sabine - I dig the hair. I appreciate how literally they made Agent Kallus as someone who, even when his helmet is off, never takes his helmet off. That or someone over there is waving hello to Zach Oat in the form of mutton chop excellence. The crutch of the Star Wars sound effects library should probably be kicked out from under new projects - it helped a lot in the 1980s. But now? It's familiar to a fault, my ears want something new. I left The Clone Wars movie fairly excited - I loved seeing Obi-Wan and Anakin interact with Jabba the Hutt, and Clones running around doing stuff in the midst of wars and investigations. Even Padme's interactions with Ziro told me we were in for some new, weird fun. Nothing here seems weird and little seems new, but perhaps that's the charm - this may be a generation of Star Wars comfort food. Next time: "Droids in Distress." The law of the spin-off usually demands a familiar face during the pilot (see: Obi-Wan Kenobi) and a special guest star in the first 2-3 episodes - in this case R2-D2 and C-3PO. It's a free download on iTunes right now, so go check it out and we'll talk about it soon!